Bust 32 1/4" 33 7/8" 35 3/4" 37 3/4" 39 3/4" 42 1/8"
Waist 25 1/2" 26 3/4" 29 1/8" 31 1/2" 33 7/8" 36 1/4"
Hips 36 5/8" 37 3/4" 39 3/4" 41 3/4" 44 1/8" 46 1/2"
Puma presents the Swift polo, a classic with a simple jacquard pattern that will never go out of style. 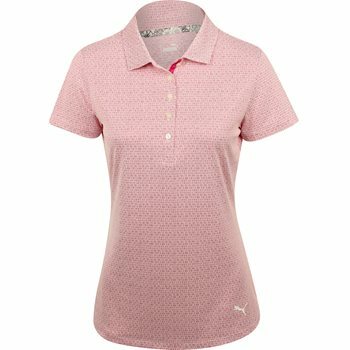 The polo features dryCell moisture wicking technology that keeps the skin cool and dry when sweating occurs. The polyester fabrication offers durability for machine washing and resistance against shrinking and wrinkles. The fabric also offers stretch for a comfortable fit and natural movement without restriction.